The Metropolitan Transportation Authority is on the cutting edge of delaying, wasting time and provoking a strike. In response to a Congressional letter to the MTA telling the Authority to accept the recommendations of the Presidential Emergency Board (PEB) for LIRR workers – which amounts to raises of 2.5% per year over six years – the MTA did the only thing it could do to avert a threatened March strike: it took its last remaining option to call for another PEB to study the situation. In response, TWU Local 100 and LIRR unions gathered for a summit at the Local 100 union hall in Brooklyn Heights, so that we could – in unity – brief legislators and the press on next steps. 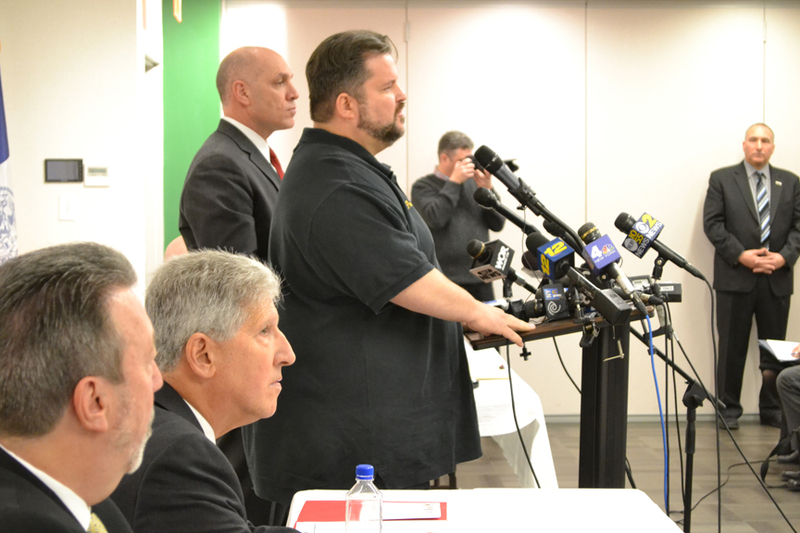 With Local 100 President John Samuelsen hosting the press event, LIRR SMART President Anthony Simon thanked Congressional leaders for “standing up to protect this system and avert a strike.” He took the MTA to task for pitting the public against workers. “They have the ability to pay without raising fares, and we don’t want to go on strike,” he said. 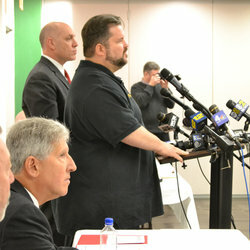 Joel Parker, National Vice President of the Transportation Communications Union, which also represents LIRR workers, explained the findings of the Presidential Emergency Board, which is a respected panel of arbitrators who have a record of impartiality in labor disputes. In its recommendation, released two months ago, the PEB did not give labor everything it wanted, but also spurned MTA demands to re-examine work rules. It recommended high health care contributions which take away half a percentage point from worker raises. Yet the MTA is determined not to say yes to the package, even though historically second PEB panels have not departed from the recommendations of the first. He said that the MTA’s repeated insistence that it has no ability to pay the raises recommended by the panel is “a phony smokescreen rejected by four consecutive panels of arbitrators” who have handled recent MTA labor disputes. He also pointed out that the MTA recently settled a contract going into 2017 with its police union which grants net yearly raises of 2.3%. President Samuelsen said the MTA has a way of challenging the decisions of arbitrators which are not to its liking and aggressively implementing those with which it agrees. A case in point was how it contested the arbitration decision, back in 2009, that gave TWU Local 100 members three years of raises. It bitterly fought that decision although it had earlier committed to accepting the finding of the panel headed up by well-respected arbitrator John Zuccotti. Now, said Parker, the MTA is making a divisive threat that “the modest wage increase the panel recommended would lead to a fare hike. Two point five percent a year can hardly be called extreme,” he said. He noted that the wage package was less than the prevailing standard in the commuter rail industry, judging from recent settlements in Chicago and Boston but that the LIRR unions are nevertheless willing to accept them. Also at the press event was TWU International President Harry Lombardo, who addressed reporters directly, urging them not to portray these labor negotiations as “some sort of sporting event” where the public are seen as spectators to a game played by contending parties. “This is real life,” he said, noting that the issue of wages affects every worker in America and union struggles should not be seen as happening in isolation from the broader issues of quality of life in our country overall. Also present were TWU Local 100 top officers including Secretary-Treasurer Earl Phillips, Recording Secretary LaTonya Crisp-Sauray, and Vice Presidents JP Patafio, Maurice Jenkins, Tony Utano, and Kevin Harrington. Both Mario Cilento of New York State AFL-CIO and Vinnie Alvarez of the Central Labor Council also were present, with Cilento pledging statewide resources and support. SMART President Simon revealed that MTA negotiators said they were willing to go back to the table if the unions would rip up the recommendations of the PEB. They’re not about to do that. Anthony Simon added that the MTA’s capital budget “is what they choose to make it,” regularly featuring huge cost overruns that the MTA finds ways to afford. New York State legislators in the audience expressed their readiness to write letters paralleling that penned by the Congressional delegation urging the MTA to settle the contract dispute. Singled out for recognition by President Samuelsen was newly-elected Congressman Hakeem Jeffries (D-Brooklyn) who has played an important role in advocating for the interests of working people.